Coriander Corriandrum Sativum is a hardy annual herb. The young leaves are often called ‘Cilantro’. Coriander is an annual herb, used for both its young leaves & the seeds. The seeds add an orangey flavour to meats. Coriander prefers light, well drained soil. It does not like damp, humid conditions, so should not be overwatered. Coriander grows well in slightly shaded areas, but prefers sun. Sow thinly, in shallow rows 1cm (½in) deep in rows 30cm (12in) apart , and cover with compost. 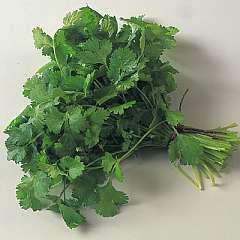 Use the leaves of coriander in salads & curries. The seeds can be used in curries. Use a container 20-30cm (8-12 in) wide and about 15cm (6 in) deep. Coriander grows well in a window box .